All you really have to do is save some money, organize your finances, leave your job, invest in gear, organize your finances and just go! Going on a long-term trip as a couple sounded a lot harder than it was. Eliot and I had always wanted to do a long trip and we thought we would do it after we got married. The idea was something like a 6-month honey moon full of adventure (trekking, diving, rafting, etc) in exotic places. We gave ourselves about 3 years to plan for it and figured we'd go sometime around late 2014. Around the fall of 2012, we started thinking about possibly accelerating that timeline to the beginning of 2013: Eliot's job was slowing down and I had just been notified that my company wasn't going to give raises to anyone that year. By the end of 2012 we had pretty much committed ourselves to making this trip happen, and by February, it was all a done deal. I will go into much more detail about finances, packing, plane tickets and other trip logistics in future posts, but for now, this is the detailed story about or food and adventure-themed journey. We love to travel and we love exploring the world so, why not? We never really let ourselves get comfortable in any situation and travel is a great way to accomplish that. We are also not resortists or fans of very touristy destinations so we usually end up going places and doing things that most people would never even consider. We are flexible, adaptable and extremely adventurous with our physical activities and of course with food (I think I'm even more adventurous than Eliot, I would actually eat tarantulas if they were served to me but Eliot said he'd refuse!). Traveling allows us to push our sense of adventure to new and undiscovered levels so we need a healthy dose of it every once in a while. 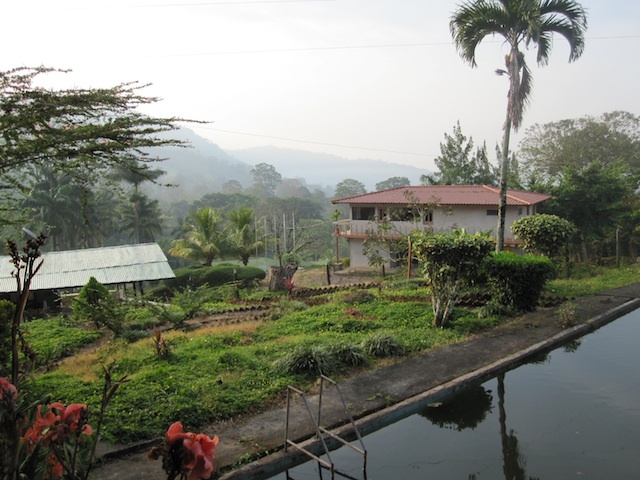 A very fine Tamal establishment in Angeles Valley, Honduras. Most good food places don't have to look like a restaurant! Nepal, Ethiopia, Sri Lanka and Sumatra, how come? The road less traveled is usually the most attractive to us. Barring Nepal, our destinations are not exactly 'popular' and you won't hear too many people talking about how their dream has always been to travel to Addis Ababa or Colombo. This is how we prefer to travel. We picked four countries over a 6 month period so that we have the opportunity to really get to know the local culture. We also wanted to go to places that were very budget friendly, had ample opportunities for outdoor adventure and, of course, offered delicious food! All four countries are very affordable and, once you get there, the cost of living is extremely affordable: 2 people can easily eat a very filling lunch with a drink included for less than $2USD TOTAL. Nepal. We were least excited about Nepal from a foodie point of view but we heard from several friends that the momos (steamed or fried dumplings), chiya (masala-style tea), daal bhat (traditional lentil dish) and even fresh fruit juices were really good there. 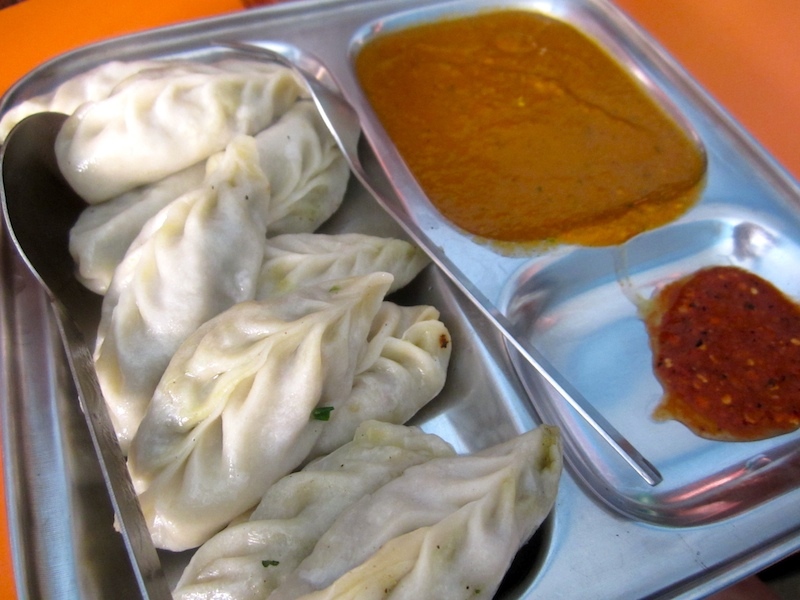 We also heard that Thamel, the backpacker/trekker place in Kathmandu had a some of the best food in the city. Still, we don't have a lot of Nepali food in California so we were very excited about trying our Himalayan cuisine. Steamed Vegetarian Nepali Momos - Spicy, Healthy and Delicious! Ethiopia! The absolute highlight of our culinary expedition will definitely be Ethiopia. Ethiopian food is amazing and we cannot wait to eat it all the time during the 6 weeks that we're there. Ethiopian food, just like its history and culture, is very unique and I have never had anything else quite like it. Ethiopians are very proud of their food and for good reason! The Injera, a spongy, pancake-like sour bread absorbs so much of the flavor of the various curry-esque servings. I am a big fan of the cardamom-spiced curries and they definitely know how to do lentils right. We are also very excited to see some of the coffee ceremonies and will pretty much be caffeinated night and day as Ethiopia is the birthplace of this wonderful bean. Sri Lanka. Tea and Curries. I actually don't think I've ever had Sri Lankan food but I imagine that sipping on tea and eating curries is basically what we'll be doing on the tear-drop island. Ceylon tea originates from Sri Lanka and we hope to visit a tea plantation while we're there. I hear the seafood is also very good and if it is at all similar to South Indian seafood, then I think we're in for a treat. Sumatra. We've both been to Indonesia before but only to a handful of its thousands of islands. Honestly, we picked Sumatra because of the relaxed vibe, the opportunities for diving and trekking in jungles with orangutans. We were not sure about the kind of food there but as soon as we heard about Padang, we got really excited! For us, the spicier the food, the better and Padang is supposed to have the spiciest food in all of Indonesia. Padang food has been highly recommended to us, especially by friends who frequent Indonesia. I plan on keeping a detailed visual memory of almost everything I eat and will upload posts full of pictures when I can have internet access. Most of the activities we want to do are in very remote areas so I won't always be connected, which is part of the point anyway! For example, our 35-day trek in Nepal includes very remote areas such as Upper Mustang and we'll also be rafting down the world-famous Karnali river for 10 days.